While sweeping an inept team like the Giants doesn't exactly warrant a parade, it was impressive, especially since the Reds are an equally inept team right now. Also, it was a fun weekend for a fan-base in dire need of some good news. Not surprisingly, the white-hot Chris Dickerson was the one grinding out the 10 pitch At Bat. And, as if to underscore his supernova like status, it was the SECOND TIME in the series that he had a 10 pitch At Bat. In the modern game where the pitch count reigns supreme, the fact that 1/10 of the pitches were used on a single Chris Dickerson At Bat is of incalculable value. Over the three games, Dickerson saw a total of 68 pitches. On the season, Dickerson is living up to his reputation as a "late-count hitter" by seeing an average of 4.24 pitches per plate appearance. Of course Dickerson will come back to earth eventually, but it's fun to dream on his current level of production. Another impressive game was had by Jay Bruce on Sunday. Bruce drew 3 walks and saw pitches 7, 6, 5, 5, and 6. He looked disciplined and did a very nice job controlling the strikezone. It's hardly coincidental that all of these high pitch At Bats resulted in 17 walks over the three game series. And, it's also hardly coincidentally that the Reds won ALL three games of a series in which they drew 17 walks. A team wide disciplined approach is what is required on this team, so hopefully this is indicative of what's to come. The Reds offense needs to get better at controlling the strikezone. The battle over the strikezone is the preeminent element of the sport of baseball and the Reds need to be relentless during their At Bats in 2009. This series is evidence that they may be capable of actually doing it and of exactly what can happen when they are. It's time to highlight the play of Chris Dickerson, who has been just about the only thing worth watching on the Reds as of late. Sadly, that isn't even an overstatement. Throughout his entire professional career, Dickerson has posted rather lackluster production. His career minor league line is .260/.360/.415/.775 with a 689/328 K/BB ratio. The 689 strikeouts in just 2202 ABs was a large part of his problem, as that works out to one strikeout every 3.2 ABs. While he is a patient hitter who works late into counts is a valued skill, his inability to consistently put the ball in play always limited his production. However, an interesting thing happened in 2008 at triple-A Louisville: After a poor April and May, Dickerson got hot. It has yet to be determined whether that is the result of the light coming on for Chris or simply a small sample size aberration. 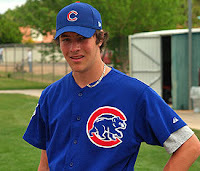 Regardless, it was enough to get Chris promoted to the majors where he has continued to lay waste to the competition. His April and May were lackluster and not even much worse than his career line, however his June, July, and August production is clearly a step up. The question remains: is it real? One interesting note that makes me think the improvement might be legitimate are the reports that Dickerson has been working to shorten up his swing. One of the knocks on Chris has been that his swing has been too long, but there hasn't been any evidence of that at the MLB level. His swing has looked great. It's smooth, fluid, quick to the ball, and certainly not too long. Unfortunately, I didn't get to see too much of Dickerson in the minors, so I can't be sure how much shortening up of his swing he has actually done. Regardless, his current swing does look good. So, he is clearly hitting a lot more line-drives over the past few months, but time will tell if that is the result of swing changes. If it is, then it could well be sustainable. That would be great for Chris, as the more line-drives, the more hits you'll get. Perhaps the real questions should be: can you carry a hot streak up the organizational ladder? Dickerson was "locked in" at triple-A and continues to rip at the MLB level. However, I have a hard time believing that you can simply carry a hot streak with you against a more advanced level of competition. Maybe you can get so locked in that the level of competition hardly matters, but some combination of legitimate improvement and a small sample size seem the more likely explanation. From watching him play and looking at his statistics, I am beginning to think that Dickerson has turned the corner. That said, he is currently hitting .328/.411/.688 and no one should expect him to produce at that level over any extended period of time. However, something more reasonable along the lines of .275/.365/.475 when added to his good speed and excellent defense would likely be enough to thrill any Reds fan. Dickerson has always had the athletic ability and approach at the plate to be an effective player, so the idea of him flipping the switch and becoming a solid MLB player isn't out of the realm of possibilities. Unfortunately, the season is running short, so the Reds won't get an extended look at Dickerson. They'll have to determine the legitimacy of Dickerson's production over the final month of the season. Unfortunately, the Reds threw away a lot of playing time that should have gone to Dickerson on Corey Patterson. However, maybe the Patterson signing gave Dickerson some much needed development time at triple-A. (Ok, that's probably not the case, but we have to find SOME silver lining to the cloud that is Corey Patterson). At the very least, Dickerson has given us a ray of hope in the dog days of summer. Suddenly, an outfield including some combination of Danny Dorn, Chris Dickerson, Drew Stubbs, and Jay Bruce doesn't seem quite so bad for 2009. Oddly enough, Dallas Buck's baseball skills may be best defined by his time playing a different sport. Buck attended Oregon State and spent two years playing defensive back and special teams for the Beaver football team. That speaks to both his athleticism and his mindset, which carries over to the diamond. Buck had a very good career at Oregon State, but his junior season was hampered by an arm injury. 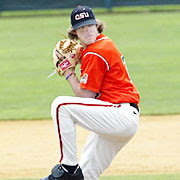 Buck still maintains the football player mentality and refused to shut it down, as he did not want to let his teammates down in their quest for a College World Series Championship. He battled through the season and maintained a high level of performance despite diminished velocity. The diminished velocity and fear of injury caused a hit on his draft status, as he was a projected first round pick before his junior year. The Diamondbacks selected Buck in the third round (two picks after the Reds selected Chris Valaika) and a subsequent physical exam uncovered the expected injury: a partial tear in the ulnar collateral ligament. Buck was likely to need Tommy John surgery before ever throwing a professional pitch. After his acquisition, the Reds sent Buck to high-A Sarasota, where he has posted a 4.15 ERA, 1.00 WHIP, 9/4 K/BB ratio, and 4.00 GB/FB ratio in 13.0 innings. In keeping with the modern pitching style, he only brings his hands up to his chest, not over his head as used to be traditional. Buck has a high leg kick and brings his leg up well past parallel. In his leg kick, he coils his lower body to store up energy. When his leg kick is at its highest point, Buck breaks his hands and begins to drive towards the plate. Buck really seems to get a good push off the rubber and uses his legs to drive his body towards the plate. A strong leg drive can help incorporate the entire body into the throwing motion, which can alleviate some of the stress that can be created by more of a "falling off the rubber" style pitching motion. Buck's mechanics certainly aren't the prettiest or cleanest around, but they do seem functional. He doesn't have any big red flags in his motion or arm action, but he does throw with some effort. It'll be interesting to see if he can stay healthy, as there isn't anything significant in his motion that indicates a heightened injury risk. 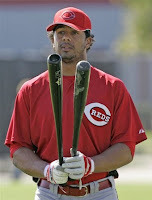 The Reds won't quite know what they have in Dallas Buck until the 2009 season, as that's when he'll finally be at full strength. However, even at less than full strength he is already demonstrating some positives. His athleticism gives him good body control, his football experience gives him a warrior mentality, and his fastball has very good late sink. While it is too soon to tell, Buck could be a very nice addition to the organization and he seems to be the type of player the Reds need. One who gets the most out of his skills and puts the needs of the team before his own needs. If Buck gets back to full strength, then he could be just the type of the player this organization has long needed. Here is a quick youtube clip of Dallas Buck. I don't think it is representative of Buck's actual motion, as it is just a single pitch and for some unknown reason Buck has a Robb Nen-esq toe tap in this video that he does not use. Nonetheless, here's a quick look at him. After the Griffey trade, Reds fans were waiting for the other shoe to drop. Walt Jocketty didn't make them wait long as he agreed to send Adam Dunn to the Arizona Diamondbacks for three prospects. While the trade itself is still incomplete, it seems clear that the Reds will get rhp Micah Owings, rhp Dallas Buck, and c/inf Wilkin Castillo. It has been confirmed that Dallas Buck and Wilken Castillo are two of the players, but Micah Owings has yet to be officially named in the deal. He is currently rehabbing a shoulder injury and injured players cannot be placed on waivers until they are healthy. However, even when he is healthy, he probably wouldn't clear waivers, so the trade probably won't be completed until after the season. 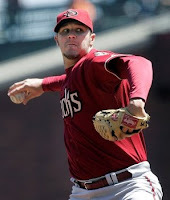 The Reds assigned Dallas Buck to the Sarasota Reds, where he has thrown 8.0 innings with a 2.25 ERA, 0,75 WHIP, 6/3 K/BB ratio, and a 3.50 GB/FB ratio. In 2007, Buck had a GB/FB ratio of 2.28 in 97.2 innings. His heavy groundball tendencies should play well in Great American Ballpark. The Reds assigned Wilkin Castillo to triple-A Louisville, where he is off to a rough start, hitting a meager .167/.194/.167/.360 in 30 ABs. SO, HOW DID THE REDS DO? It's only fitting that there is a wide range of opinions about the trade of the most polarizing figure figure in recent Reds memory. First, addressing the sentiment that the Reds didn't get enough value in return. After years of exorbitant returns for trading away expensive 2 month rentals, the market has violently snapped back in the other direction. All organizations are putting a renewed emphasis on player development and placing significantly more value on prospects. As a result, players like Adam Dunn are currently worth very little in trade. For comparison, let's take a look at Mark Teixeira, who is either Dunn's equivalent or superior, depending on your take. It's easy to argue that the Braves got a less desirable package of talent for Teixeira than we received for Dunn. The Braves received Casey Kotchman, who is the definition of league average, and minor league relief prospect Stephen Marek. While not comparable to Dunn or Teixeira, Eddie Guardado was just traded away for Mark Hamburger, a "prospect" who the Twins signed out of a try out camp. A solid veteran southpaw like Guardado would seem to warrant more than an afterthought like Mark Hamburger. Clearly, the market has shifted so far (personally, I think too far) that you just don't get impact talent for two months of an expensive veteran. That's not the way it works anymore, as you can't rebuild your farm system by parting with two months of production from one of your players. That said, I'm really pleased with the additions of Micah Owings and Dallas Buck. Both could be very solid for the Reds, but I think Buck could be the steal of the deal, as I like his upside better than Owings. Buck was projected to be a first rounder out of Oregon State until injury struck. He attempted to rehab his injury, but ultimately underwent Tommy John surgery midway through the 2007 season. In 2008, Buck has thrown 58.2 innings so far and should only get better as he gets farther away from his surgery. Overall, it strikes me as a nice package of talent for Dunn. While Castillo projects as a backup catcher or a very flexible utility player, Owings and Buck have ceilings of #2 starters. While they are more likely to end up as #3 or #4 starters, even that would make them nice additions to the organization. If a healthy Owings allows us to part with Bronson Arroyo, then we are looking at a ~$25M savings by dealing Dunn. Or, perhaps the addition of Owings/Buck allows us to deal a young pitcher (Bailey, Thompson, etc) to address a hole in the lineup (i.e. Jarrod Saltalamacchia, etc). From where I sit, the Reds added more value to the organization than they would've have gotten by keeping him. Regardless of whether it is because they have underachieved or just because they lack the talent to compete, this team has stunk for the past decade. While you can argue that Dunn wasn't part of the problem, he certainly hasn't been part of any kind of recognizable solution. And, it's difficult to envision him being part of the solution at the increased cost of $15-17M a season. A player's value to the team goes down as the salary cost increases. Fact remains, it was time for a change and Dunn's departure will ultimately be offset by other moves. Teams survive the departure of big name players all the time. In fact, they frequently get better. We can get leaner, meaner, and more successful. One player doesn't make or break a franchise. Dunn gave us a lot of good years, but it's time for a new direction. What began with so much promise has ended with little fanfare. It's hard to believe that the Griffey era is over and the Reds have little to show for it but equal parts relief and disbelief. Even after the fact, it's still hard to imagine how it all went so wrong when it seemed so right. When the Reds acquired Griffey, it was a story that across the baseball universe. On February 10, 2000, the Reds sent Brett Tomko, Mike Cameron, Antonio Perez, and Jake Meyer to the Seattle Mariners for Ken Griffey Jr. The Kid was coming home and the Reds were widely hailed as having stolen Griffey. To make the situation even better, Griffey and the Reds quickly agreed to a multi-year contract that included a hometown discount. Despite all of these positive happenings, things quickly turned sour after a strong first year. 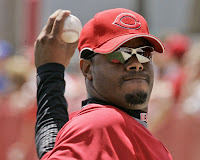 During Griffey's tenure with the Reds (2000-July 30 of 2008), the team went 650-755 for a winning percentage of .463. During that same time period, the Mariners went 731-672 for a winning percentage of .521. Granted, there were significant other factors at work, but the respective team performances clearly indicate that things didn't turn out the way the Reds thought they would. Of course, the Mariner acquisition of Ichiro Suzuki was the biggest reason for the Mariner success, but would that have happened if they had not been forced to trade way Griffey Jr.? In addition, a case could be made that Mike Cameron was as valuable, if not more valuable, than Ken Griffey Jr. during the time Griffey was with the Reds. Here is the breakdown of their respective performances from the moment Griffey joined the Reds to the day he left the Reds. When you factor in the defensive prowess of Cameron and the financial flexibility that he brought to the Mariners, a strong case could be made that the Reds would have been better off without Griffey Jr.
Walt Jocketty brought an end to the Griffey era when he traded him to the White Sox for infielder Danny Richar and swingman Nick Masset. While at first glance, it doesn't appear that the Reds got anything more than roster depth and organizational players, Walt Jocketty expressed long held admiration for both and was surprised they were available. Whether that is legitimate satisfaction at the deal or just puffery will be left up to the fans. Richar may have some upside, as he was in the running to land the White Sox secondbase job back in spring training, but injuries and visa problems derailed his chances. He arrived late to camp due to difficulties in getting a visa and then suffered a back strain and a stress fracture of his ribcage. Richar is a solid defensive second baseman and a good athlete, but lacks plate discipline and doesn't profile well at any other defensive position. At this point, his ceiling would seem to be that of a utility infielder. Masset is a big guy who throws hard, but has pedestrian career numbers, including a 5.33 ERA, 1.73 WHIP, 4.4 BB/9, and 5.4 K/9. However, the one positive on Masset would be his groundball rate, which is a pretty impressive 1.72 GB/FB, which can only help his chances of success in Great American Ballpark. Overall, it's hard not to dream about where the Reds would have been if Junior didn't have so many injuries. Sadly, those injuries derailed what could have been a magical time. What could have been a great era of Reds baseball actually turned into one of the worst. Fans let their frustration over his inability to stay healthy boil over and Griffey was treated harshly during his Cincy tenure. Unfortunately, in professional sports performance and winning trump all other considerations. A player like Barry Bonds, by all accounts an unpleasant person and a cheater, is beloved in San Francisco, while the one superstar above suspicion in the steroid era and, by all accounts, a good person was vilified by some segments of the Cincinnati fan base. Bad news for Kyle Lotzkar, as his season is done and injury questions linger. His career is just under way, so already suffering an arm injury is not a good sign. While the fracture is better news than a shoulder or elbow injury, it still is cause for concern. It would be one thing if he was hit by a line drive, but to get it just from the pitching motion is a bit disconcerting. Reds righthander Kyle Lotzkar, a 2007 supplemental first-round pick, has gone on the disabled list with a fractured elbow, which he suffered pitching for low Class A Dayton on Sunday when he had to come out during the third inning of his start in Quad Cities. Lotzkar, 18, was the 53rd overall pick in last year’s draft after shooting up draft boards when he showed a mid-90s fastball, a 78-82 mph curveball and a potentially plus changeup. This year, Lotzkar didn’t join Dayton until mid-June, but his lively stuff was already showing through as he racked up 50 strikeouts and gave up only 29 hits in 37 2/3 innings over 10 starts in which he went 2-3, 3.58. He sometimes had trouble with his control, giving out 24 walks, but that was not unexpected coming from a young pitcher in his first full professional season. No word on the severity of the injury, so we can hope for the best. Still, it's never a trivial matter when a young pitcher has an arm injury. Lotzkar has been fantastic in his professional career, but I've always had some concerns about his mechanics. Still, he seems to have a great work ethic and drive to get better, so hopefully this turns out to be nothing of consequence. His performance, age, and upside make him one of the best pitching prospects in the minors, so it would be a shame to see his progress derailed by injury. "Reed provides all the offense Dayton needs with RBI single, Rafael picks up his third straight victory. DAVENPORT, Iowa — Three Dayton Dragons pitchers combined on a seven-hit shutout and Justin Reed drove in the game's only run as the Dragons defeated the Quad Cities River Bandits 1-0 on Sunday, Aug. 3. With the win, the Dragons increased their lead on the Fort Wayne Wizards to five games with 27 to play in the Eastern Division wild-card race in the Midwest League. Dragons reliever Juan Rafael provided his third straight sparkling long relief outing to earn the win. Rafael went 51/3 innings, allowing four hits with two walks and seven strikeouts. He replaced starting pitcher Kyle Lotzkar who left the game with an undisclosed arm injury in the third inning. Since joining the Dragons from the Gulf Coast League Reds, Rafael has pitched in three games and earned the win in all of them, tossing 15 innings while allowing just two runs. 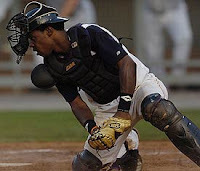 The Dragons scored the only run of the game in the fifth when Reed drove in Keltavious Jones with a single. The Dragons are off today and open a four-game series with Fort Wayne at Fifth Third Field at 7 p.m. Tuesday."